When Scarpa introduced their original Alien 1.0 in 2012, the Italian-based boot maker dove all in to build a skimo purebred. Weighing just three pounds per pair thanks to a slimmed-down cuff built purely of carbon fiber, a svelte liner and a closure system that left traditional buckles earthbound, the Alien resembled something between a hiking boot and a space shuttle. But while the boot defied gravity on the ascent, coming back down proved to be a venture exclusively suited for the skimo set or those with strong ankles. 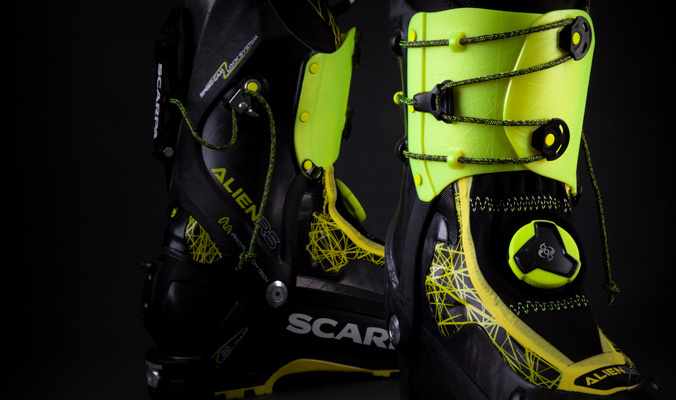 Last year, Scarpa took that tried-and-tested Alien and reformed it for improved downhill capacity with the Alien RS. It retains many of the original Alien’s touring-focused attributes, including a scant weight of 3.9 lbs.—making it the lightest boot at our 2019 Gear Test Week. But other updates mean it can better handle descents and mid-fat skis. Specifically, rather than a full-carbon cuff and polyamide lower, the entire RS is built from sturdy Grilamid that’s infused with carbon fiber; the cuff rises taller than that of the original Alien to a height similar to most AT boots; and the traditional tongue-style liner, while thin, is less like a sock and more like what most skiers expect in an AT boot. In ski mode, the RS leaves its predecessor behind, earning high marks for fore/aft and lateral stiffness from our testers who were universally impressed by the boot’s power transfer and control. “Virtually no lateral movement and only minimal forward play, positioning their stiffness and performance almost within the bigger-boot category,” one noted. Scarpa, in fact, rates the flex index at 95—the same as their F1, which weighs about 1.5 lbs. more per pair. That relative strength doesn’t make the RS an anchor for climbing. Perhaps most noteworthy, and true to its Alien pedigree, the RS has no buckles, which both pairs down weight and enhances efficiency. The RS utilizes a ratcheting lower-shell Boa closure that offers a snug, secure fit and is simple to manipulate—“easily tightened or loosened with gloves on,” one tester said. The real magic lies in Scarpa’s Speed Cam Lock System that tethers together the upper cuff and walk mode using a Dyneema cord: lift the rearward bar to loosen the cuff and open a 72-degree walking stride (an increase from the earlier Alien’s 60 degrees); flip it down to secure the cuff and engage ski mode. The system initially puzzled a few testers—“I felt as if I were playing cat’s cradle; not the most intuitive,” one said. But once testers dialed in the appropriate tension, it was set-it-and-forget-it simple. “Incredibly effective,” another said. “Perhaps the best walk mode on the market; just flip the lever,” a third offered. As for comfort, Scarpa’s narrower toe box, 99 mm last and slim width through the heel notably left many female testers pleased, despite the unisex size range ending at roughly a women’s eight. “More comfortable than 90 percent of my street shoes,” one said. “With a stiff and powerful flex—yet remaining ultralight—the RS feels somewhat magical on your foot,” one tester summarized. Whether a result of magic, astrophysics or something in between, the RS proves that improving downhill potential simply requires the right combination of height, carbon, plastic, a cord and little else.